Find out more about the GEKA® plus hose trolley “P125” by navigating the hotspot. 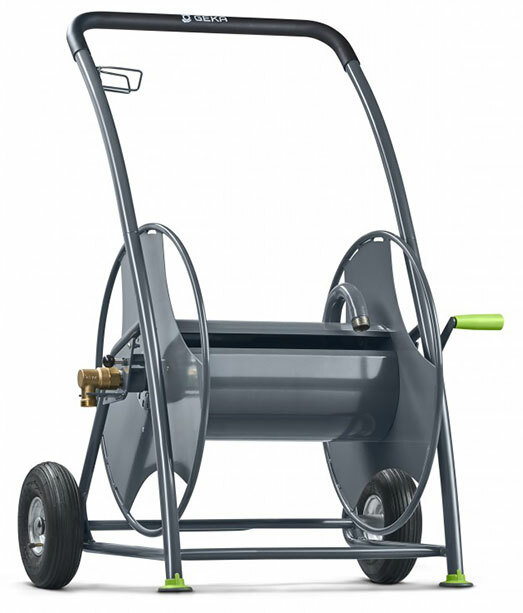 This hose trolley is a real all-rounder. With its hose drum that can be locked in 12 positions, high water flow rate and curved intake tube that prevents the hose from kinking, it proves itself to be an ideal addition to garden centres, agriculture, construction sites, business and industry. Like the smaller models in the series, it is of course robust, made of powder-coated steel, firm, non-slip, designed to be ergonomic and easy to use, and suitable for drinking water.